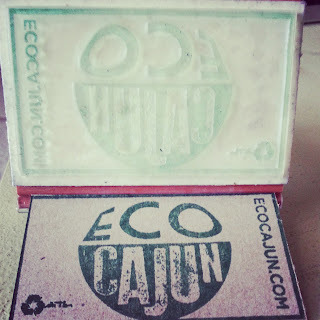 I have finally completed the process of making eco cajun business cards, and I am so excited about it. Over the past few months, I brainstormed different eco-friendly options, including recycled paper and plantable seed paper, but nothing fully caught my eye. Then, I was inspired by an Etsy shop owner (from whom I purchased a recycled material cat collar) and decided to get a stamp custom made, and use cardboard for the cards themselves. This way, I can make only as many as I need, instead of printing too many and having them sit around. So, if you are interested in getting a custom stamp, for anything, head over to The Stamp Maker! Have a beautiful spring weekend, and wear your green for the environment AND St. Patrick's Day!